The Faculty of Economics organized its fifth annual International Conference on South Asian Economic Development (SAED) on 21-22 February, 2019. 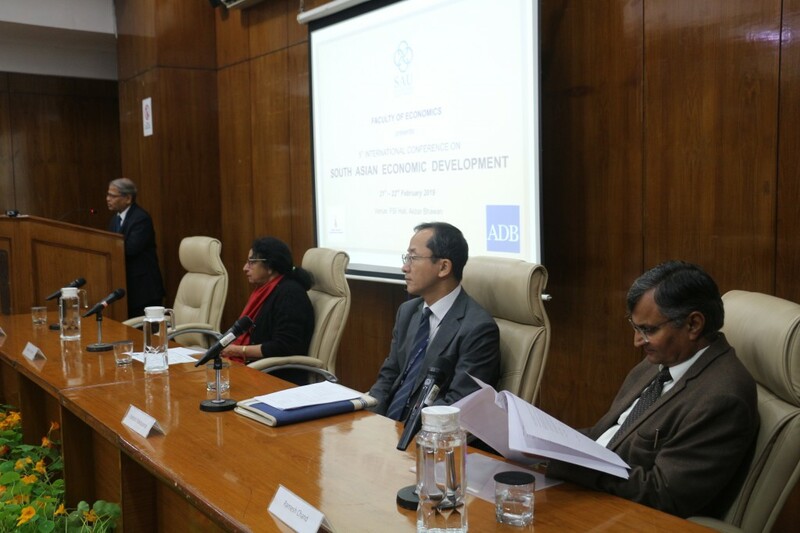 The conference was co-organized with the Indian Resident Mission of the Asian Development Bank and Indian Council of Social Science Research (ICSSR) as a knowledge partner. The annual conference series which started in 2015 has been successful in spanning across academic networks in South Asia and providing an international platform to deliberate on methodological advances in economic development from alternative theoretical paradigms, in all areas of economic research relevant to the region. The conference started with welcome notes from Kavita A Sharma (President, South Asian University) and Santosh C Panda (Dean and Professor Faculty of Economics & Vice-President, South Asian University), followed by opening remarks from Kenichi Yokoyama (Country Director, India Resident Mission- Asian Development Bank, New Delhi) and a keynote lecture titled “Current Issues and Outlook in Agriculture” by Ramesh Chand (Member, NITI Aayog, New Delhi). Mr. Yokoyama elaborated on the issues, challenges and opportunities specific to South Asia. He highlighted the need for a strong multi-agency coordination at various levels to address issues like climate change, rising inequality and inadequate infrastructure. Prof. Ramesh Chand in his lecture discussed the profound changes which have occurred in Indian Agriculture in last 30 years and emphasized the need for sustainable model of agriculture. Rest of the conference comprised of 2 panel discussions, 14 technical sessions and 1 plenary lecture. This year the conference received around 400 papers out of which a total of 44 were selected and presented by researchers from across South Asia as well as from Europe, United States and Japan on a diverse set of theoretical and empirical issues. Each technical session had a session chair and discussant(s) who provided valuable feedbacks on the presented papers. The chair and discussants were renowned academicians from across different universities in the region. The first panel discussion was on “Economic Development: The South Asian Context” chaired by renowned economist, Professor R. Nagaraj (Indira Gandhi Institute for Development Research) and included experts from across the region as panelists: Mr. Rana Hasan (Director, Development Economics and Indicators Division, Asian Development Bank, Manila), Dr. Wahiduddin Mahmud (Former Professor, University of Dhaka) and Dr. Dushni Weerakoon (Executive Director, Institute of Policy Studies, Colombo). The panel centered its discussion on some of the interesting issues pertaining to the region namely the Bangladesh development paradox, potential of manufacturing sector in India & issues related to poverty, inequality and development in the South Asian region. The first day of the conference was concluded by a plenary lecture “Has India De-industrialized between 1991 and 2011“delivered by professor R. Nagaraj. The penultimate session of the conference was an interdisciplinary panel discussion on the “Political Economy of Development and Democracy in South Asia”, chaired by Dr. Pulin Nayak (Former Professor, Delhi School of Economics, New Delhi) and four eminent panelists : Dr. Rohini Somanathan (Professor, Department of Economics, Delhi School of Economics, New Delhi), Dr. Satish Deshpande (Professor, Department of Sociology, Delhi School of Economics, New Delhi), Dr. Gurpreet Mahajan (Professor, Centre for Political Studies, Jawaharlal Nehru University, New Delhi) and Dr. Prabhat Patnaik (Professor Emeritus, Center for Economic Studies and Planning, Jawaharlal Nehru University, New Delhi). The spirited and lively discussion by the interdisciplinary panel offered new perspectives and approaches to one of the most important debates in the socio-politico-economic sphere of contemporary times in the South Asian region particularly India. The conference concluded with a vote of thanks and closing remarks delivered by conference chair Dr. Santosh C. Panda (Professor and Dean, Faculty of Economics & Vice- President, South Asian University).